Check out the comic in its original home. 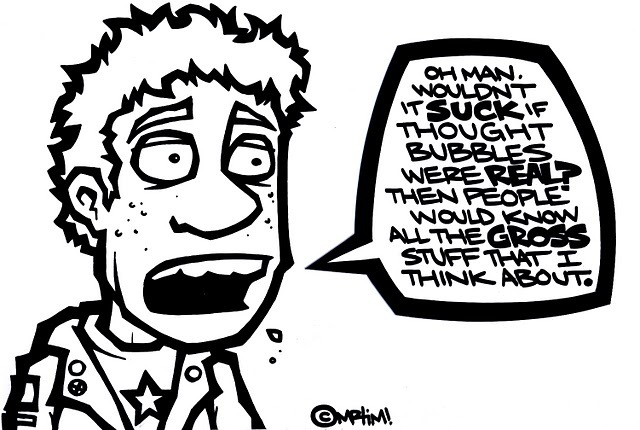 If you’re unfamiliar with them, thought balloons are one of the tools of a comic book creator. In the comic above, you have an example of a speech balloon. We can tell these are the words coming out of his mouth because there is a circle drawn around the words with a pointy triangle aimed at his mouth. Thought balloons are a bit different. Instead of a triangle, there is a trail of circles. This shows us what the character is thinking inside their head. 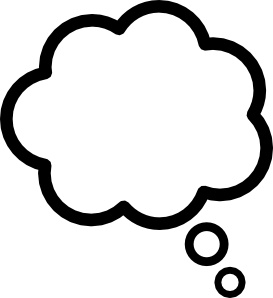 What if people could see our thought balloons? What if everyone could see every thought that wandered through our heads? I don’t know about you, but I’d be ashamed of all the sinful things that would be on display. Thoughts of lust, anger, envy. But because people can’t see my thoughts, I kid myself into thinking that they are hidden and no one knows them but me. But God can see our thought balloons. Our every thought and deed is on display for him to see. Hebrews 4:13 says “Nothing in all creation is hidden from God’s sight. Everything is uncovered and laid bare before the eyes of him to whom we must give account.” God sees those thoughts that you mistakenly believed were locked up tight inside your head. And he will call you to give an account for them. You’ll have to explain yourself. Our every sin will be laid bare before him. And we’ll have no choice to admit that we are unworthy of belonging to God’s Kingdom. So it’s a good thing that Jesus died in our place. It’s a good thing that Jesus has rescued us from the punishment we deserve. Because there’s no hiding from God’s ability to read our thought balloons.